300 Healthy Gluten-Free, Dairy-Free, Soy-Free Recipes? Oh YES!! A Whole Foods Cookbook and Guide to Raising Healthy Children including over 300 nourishing gluten-free, dairy-free, and soy-free recipes. And guess what? I am giving away 3 copies of it. Why? Because this is THE cookbook and resource that perfectly captures everything I believe in regarding how I feed my family. And more than anything, I believe that everyone should have a copy of this one in their cookbook collection! This book, written by Alissa Segersten and Tom Malterre, MS, CN, sets an absolute foundation for raising healthy, resilient children (and keeping ourselves that way in the process as well). 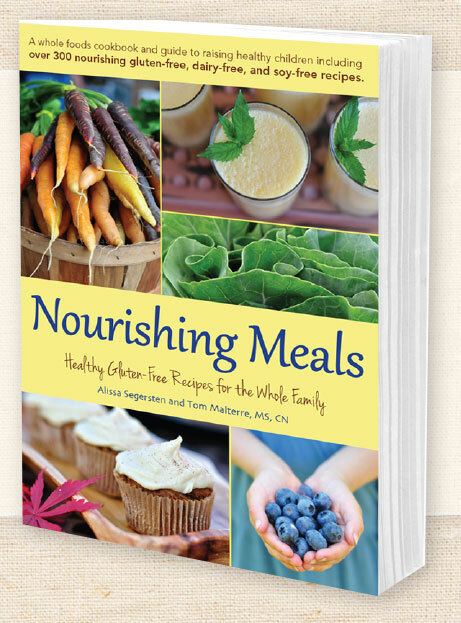 Nourishing Meals has a huge variety of recipes, from plant-based main dishes to nourishing grain-free desserts. No matter what your diets are, this book has something for everyone. Our family has had so much fun cooking from this book. And I love the idea that everything that I make from it lends to raising healthy children…and adults! UPDATE: THIS CONTEST IS NOW CLOSED. WINNERS WILL BE CONTACTED BY EMAIL! To enter to win a copy of Nourishing Meals, just simply do One, Two, or all Three of the following. Just leave A SEPARATE COMMENT for each thing that you do so that you can earn an entry for each. 1. Tell me what intrigues you about this book! 2. Follow Cook It Allergy Free on Facebook, or tell me if you already do. 3. Share this post with your friends on Pinterest, Twitter, Facebook or other social media and leave an additional comment saying you did so. Help spread the word about this great new cookbook! Everyone should own a copy of this one! The contest will end on Wednesday, October 10th at 9.am PST. The winners will be announced then. You must be at least 18 years old to enter. I would definitely love this cookbook. I follow their blog, too, and always appreciate the recipes they have on there. I love the focus on fresh and whole foods, and feel like I learn interesting health facts and tips, too. So, if thIs is anything like their blog, I’m sure it is a gem. Thanks for offering a giveaway! I shared this on Facebook. I follow Cook it Allergy Free on FB, in fact that’s how I found out about this giveaway. The thing that intrigues me about this book is I know I’ll have nutritious, delicious, well tested recipes and all I’ll have to switch out are eggs and corn and a few others but I still know the recipes will work! I love the way they test everything out and explain how the recipe will work for you. I’ve just shared this on FB. I follow you on facebook and I was overjoyed with excitement when I saw this book. This book looks awesome and is exactly what I need. I always struggle with cooking and my son has food allergies and sensitivities so this would definitely help me with his diet. Even if I don’t win, I’ll probably buy it. 🙂 I posted it to facebook also. Thank you for this wonderful offer. Gluten, corn, eggs, soy, food color… are among the many things that I can’t have. I really appreciate when someone has gone through all of the hard work to find ways to make tasty foods that won’t make me and many others sick! I would love to explore the recipes in this book! I’d love to win a copy of this cookbook. I have been attempting a gluten free, dairy free diet for the past 6 weeks and I’d love a chance to try out some of the recipes in this book. I’d love to have this book! I like that it’s g/d/s-free and contains SO many recipes. I’ve been following The Whole Life Nutrition Kitchen’s blog and love their recipes, so I’d love to win this cookbook. I like you on FB – Suzanne Hill. I’m in Canada. Hope it’s ok to enter. I love the fact that this book is a nutritious way to eat gluten free. It seems that most of the books out there just fill their recipes full of starches and sugars without regard for the people’s health. I already follow you on FB. I would love to win a copy of this cookbook! I just started eating gf myself and need all the help I can get regarding what to eat, what not to eat, recipes, etc. I’d also like to get the rest of my family eating healthier but need to find creative ways to do that. I already follow you on fb! After years of mysterious health problems, having multiple tests and surgeries, and finally finding relief through diet, I am convinced and dedicated to changing the way my family eats will benefit everyone. As a first time mom-to-be early this December I am dedicated to bringing this dietary change into the lives of my children as well as offer more options for my extremely supportive husband! Eating allergy free and experiencing the life changing benefits of a gluten and dairy free diet has me searching for a great cookbook to incorporate into my family, I would love to have this in our home! I also follow Cook It Allergy Free on Facebook and love it! In June we found out that my daughter is seasonally allergic to dairy and seemed sensitive to gluten as well. I also found out I have hyperthyroidism. After three months of trial and error with medication, I’ve given up on the pills and am trying alternative treatment that’s more based on my diet. It’s actually been really great! I feel better now than I did with those yuckie pills. But I’m constantly looking for recipes that will fit our new diets but also appeal to both mine and my four-year old’s taste palettes. It’s been challenging. But definitely worth it! I’d love a book like this to help give me gluten free options for cooking because that’s been my biggest hurdle. Whole wheat/white flour are everywhere and in every recipe! Pinned it! What a great resource! I am a perdiatric nutritionist and my patients are always looking for great allergen-free recipes; I’ll point them here! Having enough new, healthful recipes that makes us feel good every weeknight for the next year–what a treat that would be! I already follow you on facebook and I shared the book on my page. A year and a half ago I found out I have allergies to corn, gluten, soy, dairy, eggs and many others. At first it was difficult but now I see it was a complete blessing. My entire family is now more healthy with the way we eat. But I am always looking for new ideas… I have so much more to learn!!! I follow you on Facebook, which is how I learned about this fantastic giveaway! I shared this on pinterest. I shared this giveaway on facebook, too! I just pinned this to my Pinterest board and will “like” your page tonight (Facebook is blocked here.) This cookbook looks fantastic. I would love to have an inspiring guide like this because, 9 months into going gluten free, I’ve realized it’s more than just avoiding or substituting wheat products. It’s required a very new strategy for shopping, planning, cooking and eating and I’m still on a pretty steep learning curve. I love that this cookbook is also soy free, since soy products can trigger migraines for me. Thanks for the opportunity! I would like to have this cookbook because I am starting to take better care of what I put into my body and I know I have sensitives to gluten and dairy but it can be hard to find a cookbook with those omitted. So to have a cookbook with those omitted already would be wonderful. Plus my nephews and sister are all gf/df/sf so it will be easier to cook for them when we have get togethers. So many benefits with this cookbook! 🙂 And I already follow cook It on FB. Thank you! The recipes that I have heard are in this book sound fabulous and look at the picture on the cover! If the food is as good as it looks, I definitely want one! Thanks! I follow you on fb! I shared with all of my followers on fb. Already follow you on fb. But would love this book since I’m still new to full gf. And more recently df too. Thanks! I like that the book has both gluten free and dairy free as I can’t have either. I shared your post on facebook. I already “Like” Cook IT Allergy Free on fb. And what intrigues me about the books are the incredible sounding recipes! I find the GF diet hard to follow at times and having great new options to try will liven things up! I suffer from gluten and lactose intolerance. However I am the only person in my family that does. And as the main cook, it’d be great to discover more meals that would please and suit everyone instead of cooking 2 separate things a lot of the times. What intrigues me about the book? Everything. Since going gluten free I’ve gotten into a rut and need to be pushed out of my comfort zone. I want to start using more than basic flours, more whole grains. I recently subscribed to their blog, but I haven’t tried any of the recipes I’ve bookmarked. This book looks and sounds wonderful. You KNOW how much I want this book, Kim! I want to do their elimination diet again and this would totally help (plus some of my current favorite recipes are from their blog already). Not to mention these are things I already avoid and have a hard time finding healthy (low starch) cook/baking books that have these 3 already omitted. Hope to see you soon! Already follow you on facebook! Everything about this book intrigues me! I’ve been following Whole Life Nutrition since first going gluten and dairy free two years ago and now I am also refined sugar free. Their recipes have been reliable, healthy and tasty. I adore them and have this book on my wish list. Thanks for the giveaway! I already follow you on Facebook. Thanks! Would love healthier Gluten Free Recepies. So many are heavy on the starches and carbs. I am typle I Diabetic and Celiac. More Gluten Free Recipes would be wonderful and more healthy ones!! I am really trying to learn how to cook, gluten and dairy free. My daughter has extreme dairy allergies and I am newly gluten free. I would love to learn how to make meals that we can both enjoy, and that still taste good!! I am intrigued by this cookbook because one of my childhood, life-long friends has major issues with food and this seems to be the route she is taking and I’d love to learn more recipes to share with her. As a fitness fool, I am always trying to keep up with healthy alternatives for everyone to share, no matter what they have going on in their life so there are no excuses to not eat healthy and live a well life. I already like you on facebook and follow you! I shared your link to your page and about this give-away on my fitness page on facebook. I get questions all the time about how to make recipes gluten free, dairy free and so on. This would be a great help to them and myself to offer suggestions. I followed a Vegan diet for a whole month to prove that it really wasn’t that difficult and possible to eat well while hitting necessary macros for being in the fitness world. I am gluten intolerant and my husband is lactose intolerant. Also, with my thyroid problems, I should avoid soy. This covers everything we need to avoid in the house. Perfect for us. I already like/follow you on FB and have for a very long time. What I find intriguing is the knowlege that having a copy of your book for my very own means I won’t have to wait until I have computer access to check out your recipes. I don’t have my own computer and use one in the library where I work. Three Hundred recipes???!!! Holy cow! That sounds fabulous! I am inspired!!! What a fab looking cookbook! I liked you on fb and shared it! I suffer from histamine and gluten intolerance. It means I need to stay away from gluten, dairy, yeast, tomatoes, spinach, soy and all fermented food or processed food. And a bit more. All high histamine meals are forbidden and the only way to stay symptom-free is to cook for myself every day. The good thing is I just love cooking and proving my friends that allergen-free food can be tasty as well. I am a scholar from Europe and I will never have chance to get these amazing books once back home not talking about all super ingredients you have here and I would love to try. This is why I would be happy to have one copy while I am here and to share my experience with my friends and family. I “Like” Cook It Allergy Free on Facebook! I am intrigued by the cookbook because it appears to be full of recipes that are exactly how we eat!!! And the Blueberry Teff Muffins you mention are very intriguing. We love teff, and it is rare to see a recipe that includes it without changing it to make it your own. I shared this contest on my facebook page! The gluten-free aspect of this book is intriguing for me! I’ve been a vegan for quite a while now but have just recently been dabbling into the gluten-free recipes. It’s hard!! I liked Cook It Allergy Free on FB!! I am a follower from Brazil and a mom of a 21 autistic boy. A healthy and nourish diet made a huge difference in our lives. Because of this, I spread a nourishing diet free of gluten, casein, soy and many others things to all my country and to others in portuguese language. I shared with my friends on FB. Not only is it gluten free…it is dairy free. I am gluten free and could really use some new, fun recipes! Thanks!! I am following you on Facebook and interested and I’m excited to read your book because I have a gluten intolerance and finding gluten free food that tastes good is extremely hard for me and the recipes in your book sound amazing. This cook book includes more that just gluten intolerance. My son has several allergies and it is difficult to find food that will be safe and that he will enjoy. I now follow on facebook. I love your blueberry peach crisp recipe! I follow you on Facebook. I am liking your page on FB – can’t wait to see what updates/recipes you have to help me with dairy free and gluten free recipes for my kiddos! What intrigues me is the ability to cook good tasting food while cutting out foods that cause allergies/health problems. I’m just learning so this would be a great resource! I’m already a fan on Facebook! My son is gluten, dairy, soy & corn free and I ALWAYS need inspiration! I already follow you on Facebook and I’m happy to share this with my community. thanks! I have fructose malabsorption and as a result suffer from IBS….I find it really hard to make yummy meals that suit my needs as well as making something that my partner actually wants to eat too! Due to my daughter having cancer it is very important to provide the most nourishing meals possible. We are gluten, sugar and dairy free. I think this book will help to provide us with better recipes rather than the same old, same old. About to follow you on Facebook now! I’m intrigued by this book because my hubby is lactose intolerant. Additionally, his classmate is gluten intolerant, and we’ve been investigating ways of changing our diet to incorporate more GF foods that we can share with his whole class. A young boy in our church was recently diagnosed with Autism, and the family has been advised that a GF diet would be beneficial to him. I’d love to be able to share this information with them. I follow their Whole Life Nutrition blog. It is a great resource and has been an incredible inspiration for cooking and becoming healthier on a very small budget. Their cookbook would be awesome to win, especially since not all of her recipes are included on the website. The author is always alluding to some delicious sounding recipe that can only be found in this book. Thanks! I follow you on facebook! I shared this giveaway on facebook! I would like to win a copy of this book because I already know from their previous book and website that their recipes are good and are my type of cooking. Thanks for the giveaway! I “like” you on FB. Allergy- free recipes that are tasty, That’s what intrigues me! I would love to check out this book. My son has allergies and eczema and we are looking for solutions in his diet since nothing else has worked. Pinned this too, thanks for the giveaway! A whole book of HEALTHY GF recipes, with such beautiful images!? I’d love to win it! I would be so excited to have a cookbook I don’t have to sub ANYTHING! I am so glad to have found this. Rock on for food allergy cookbooks! I am GF and dairy free and LOVE to cook. These resources are to awesome to have. Thank you so much for all that you do! I would love this ! I am lactose intolerant and love cooking! I want this book so badly! My husband suffers from multiple food intolerances including dairy, gluten and soy as well as psoriasis. My three kids have soy and dairy intolerances. I am constantly looking for recipes that are nourishing, delicious, and safe for the whole family. I am tired though, so tired of trying to meet all the dietary requirements and serving the same things over and over. I think this cookbook will really help! I want to learn more and the additional info in the book also really appeals to me. I shared this post on facebook! This cookbook looks yummy. Would love to cook from this book. I ‘liked’ your site on FB. I followed you on facebook! I have only just recently learned about the effect different foods have on my body, whether its through allergies or sensitivities or just because certain ingredients make me sluggish and foggy. I used to think this stuff was hogwash, until I tried out the elimination diet. I felt great–lots of energy, no brain fog, slept great, went off my happy pills, and just all around was really really happy with how I felt. The one big thing was that I felt somehow lighter—not related to how much I actually weighed according to my scale–but it was an inner lightness. I don’t ever remember feeling so great. The big challenge of eating this way is finding great recipes. When I first found out about this cookbook, I immediately began searching for a copy locally. But I can’t find it anywhere near me!!! I would love to get my hands on this cookbook and just tear up the kitchen! This really, really interests me because I have a handful of friends with food allergies! One is gluten free and dairy free, another is gluten free and soy free, and others with so many more! I’m always looking for new inspirations to cook for them! I “Like” Cook It Allergy Free on Facebook. I shared this post with my friends on Facebook. Actually, I’d already shared with my Facebook friends a link to the book some time last week. But I did it again! Of my family have multiple food allergies ( including myself, dairy) and I would like to learn more about things I can cook to accommodate those allergies!! I would love to have a cookbook that is Gluten Free, Dairy Free, and Soy Free. I would live to win a copy…..my daughter and I both have celiac, I also have multiple sclerosis and arthritis at only 32 so I have overhauled my diet to get rid of junk and would live to have one new options….I am sharing on pinterest and Facebook! I have been using nourishing meals.com as my go to website for recipes that seem to never fail me….the cookbook would be such a gift to myself if I didn’t have to actually buy it! I just seem to be very much aligned with the type of cooking the authors are doing and why they are doing it. The results are amazing and healthy and always garner such praise and surprise when I get to share them with other people. Pick me, pick me! I shared the post on FB! I’m so intrigued by the ‘whole family’ aspect. Especially as a married woman who has a young daughter and I want more kids and I want to make sure they grow up with the best healthy foods! And I need to expand what we eat at home as a newly plant based family. I am learning about gluten free so any and all recipes are welcome! I am intrigued about the nutrition aspect of this book – key nutrient information and understanding how they relate to ailments… that is amazing information! It is so amazing that there are cookbooks with wonderful recipes for all the allergies out there. Whole Life Nurtrition Cookbook is one of my all time favorites. I am Following Cook It Allergy Free on facebook! Shared this on my facebook page! Having this cookbook would be such a valuable tool as I strive to improve the health of our family after starting to follow a gluten free, dairy free and soy free diet! Ahh, a cookbook for those of us who really cannot eat what makes us sick, and we support others in similar situations. I’ve heard of so many great recipes out of this book. It’s on the top of my cookbook wish list right now!! I need some new vigor in my cooking/baking and I believe this cookbook could help me find the excitement I’m lacking! I “liked” you on facebook, not only so I have another entry to this contest, but also because I’m intrigued by your website! I was happy to repost this post on facebook so others can become informed of both this cookbook and your website! Always looking for healthier ways and inspiration in feeding our family. We have a few different intolerances/allergies in our family and it can be difficult to get something on the table that excites everyone. Thanks for the chance to win this fabulous cookbook. I heard rave reviews. So excited for this book as so many of my clients, family members, and friends have issues with gluten. If it’s anything like your previous book, I’m sure it amazing. Thank you! Oh, and I also shared it on my Facebook page as well, and am happy to follow Cook It Allergy Free. Thanks again. I love all of the recipes I have tried from Nourishing Traditions! I would love to try the ones in the new cookbook! I am liking your site as well as sharing this. Thank you so much! My son has a penut allergy so I cant wait to try some of your recipies!! What intrigues me about this book is to see all that they have learned and incorporated into this cookbook since their last book. It seems so much more geared to food allergies and sensitivities. Thank you! I just liked your facebook page! thank you! I have tried so many of Ali’s recipes and they are family friendly, healthy and delicious! I’d love to win a signed copy, thanks for the chance! I shared on facebook too! following cook it allergy free on facebook too…thanks for all you share! Great tips you have!!! i love the taste and good looking ideas how to prepare delicious recipes!!!! I am already following you on facebook and have shared the post. This cookbook looks awesome, would love to check out all the gluten-free recipes!! I am so excited about this cookbook. What a great resource. Thanks for the giveaway! I “like” CookIT Allergy Free on FB. I follow you on FB. This would be great for my little guy that has multiple allergies. He’s getting tired of eating the same things and I’d love to have some new recipes. I’ve been waiting for Nourishing Meals to come out. I’m constantly recommending “The Whole Life Nutrition Cookbook” to people who want to eat more whole foods in their diets. Thanks for the giveaway. I already follow Cook IT Allergy Free. I am intrigued by cookbook designed for the whole family with nutrition and allergies in mind. Hi there! RT contest to help spread the word. Thanks for offering a great resource-for free! Loved their first cookbook and can’t wait to get a peek at this one!! This book is awesome because they stress alternative grains and grain-free recipes, which is rare and so important for me! I also love their creativity and how delicious most of their recipes turn out. I would love this book because I have the first one and know first hand how amazing their recipes are. I am allergic to gluten, dairy, soy, and eggs so I gotta have great cookbooks around! I use the other one daily! I am following you on FB! I shared this on FB! Followed you on FB…I am a firm believer that food heals the body ! I like that this book has so much information on healthy eating. I have lots of family and friends that have so many allergies to gluten, dairy, and much more. Posted your book on my Pinterst and FB pages.. I want all my friends to see this. I am always excited to try new recipes for my family. Eating clean and healthy is important to me. I am intrigued by all the delicious-sounding, and nourishing recipes! Thanks for the giveaway! This cookbook looks wonderful! My husband has a lot of food allergies and I am looking for interesting, creative recipes to spice up our meals. I definitely want to try some of these recipes! I am a busy Mama navigating through the world of allergen-free cooking and baking. Both my kids have a number of food allergies so I make the effort to ensure they are healthy. I love the cover of your cookbook and am intrigued to know which recipes I may never have thought of trying for my food adventurous family. Thanks! I follow you on FB and I’m really intrigued about the recipes, as it is hard for me to find allergen free recipes. I’d LOVE to win this book simply because that is just how we eat and I am dying for some new inspiration. Both my girls are GF, as well as the eldest being dairy free. We limit unnatural sugars in our house, and don’t do soy at all. already follow you on FB! I liked your Facebook page! I shared this post on Facebook. I am intrigued by this cookbook because my almost 11 month old son is allergic to wheat, corn, eggs, oats, barley, tomatoes, possibly rice and also no dairy. Since I am still nursing him, I am also avoiding these ingredients. My older son is allergic to tree nuts so we have a lot of challenges with food in our house! With a 1st birthday coming up, I’d love to find a special treat he can have in lieu of the standard cake. I also just need ideas for meals we can all eat so we don’t have to make a bunch of stuff for every meal. I’ve just started to examine my issues with food allergies, and this book looks like it would be awesome to help me! I recently started eating vegan, gluten, dairy and soy free. It is great to have a resource. I have such a hard time finding ideas. Everything has soy if it is vegan. GFDFSF is the way we roll in our kitchen, and like many people we’re in a bit of a rut. Participating in unprocessed october has led me to look for more recipes rather than always making the same old stuff, but I can always use some help! I love a chance to cook and eat more healthy, it keeps me out of my pattern of eating basically the same ingredients over and over, day after day…blah! This book will give me more chances to experience healthy and delicious foods! I now follow “Cook IT Allergy Free.” Did not know it existed! I have shared this page with friends on FB! I would truely love to share this book with my clients as well as my family !!! candida almost killed me once…god gave me the chance to teach all about being healthy …now I am trying to make that happen….Thank you !!!! I frequently say, “if I only knew then what I know now”. It is no different when it comes to food and nutrition. I have raised my 2 children cooking the way I was raised. As time went on, I blew up to 230+ pounds on a 5’4″ frame. Not good…Things happened and my world shifted to a mostly plant based diet, in which I was able to drop 70 lbs. I’ve come to learn that my body just doesn’t do well on gluten. I feel so different. I can’t say I’m ‘allergic’, but I can honestly say I’m ‘intolerant’. Therefore, I am always searching for good, nutritious, gluten-free recipes to add diversity in my meals, etc. Perhaps your book will add to my repertoire…thanx! I am intrigued to see if I could heal and get out of my wheelchair! That Blueberry Peach Crisp sounds wonderful! My family is vegan, gluten-free and sugar-free and all I make is very simple foods, this cook-book would get me to do more interesting delicious fun meals. Plus my oldest son is a professional cook and I’d love to show him that the way we eat is yummy and fun too. I’m also a health coach and would love to recommend it to my clients. I’m intrigued by any book that will help me with meals that my whole family will enjoy, since that family is about to grow! I’m pregnant with twins, and I have a sensitivity to gluten, dairy (and recently, soy). I’ve been struggling with meal ideas throughout this pregnancy, and want so badly to put healthy meals on the table that are gluten, dairy & soy free, that taste great. I’d love to try your recipes! I had no idea there is someone out there with recipes within these parameters-I’ve just been modifying what I can, using mostly almonds and coconut as a flour-and grains to substitute the rest. I am dying to get my hands on this book. I use their first book as a bible. Pages are falling out and stained from so much loved use! I have shared this contest through twitter and facebook too and have liked your Facebook page. Look forward to trying your recipes! I am going to checkout your app! Thanks! I’d love to win. Allergies abound in this household, and the author’s first book helped us thru the whole elimination diet thing. Very grateful for their books! Their recipes are so creative and inspiring! Would love to have a copy on hand. I’m just discovering that I may have more food allergies than I would have thought. I’ve been hearing a lot about the inflammation it may be causing in my GI system. Very interested in learning new recipes. I am gluten, soy and dairy free due to celiac disease and allergies. Always looking for new recipe ideas for my family! I am interested in this book because of all the things I have read about gluten lately and how it seems to be affecting more and more people in a negative way. I am intrigued by this book because my 17 yo son, who has a diagnosis of Autism, has been gluten and dairy free for several years. We both know that when he eats dairy, he has physical symptoms, so he’s motivated to stay away from dairy. The challenge comes from keeping him gluten free as the benefits are cognitive and behavioral, which are obvious to me, but less so to him. He frequently challenges me on the gluten free front but when I can provide delicious gluten and dairy free options, he is less likely to complain. I need all the help I can get to keep him healthy and functioning at his best! Intrigued by this book because so many people have recommended their first book to me! I need all the help I can get when it comes to cooking for allergies and good health! I have Ally and Tom’s first book which I love and in eagerly anticipating their new book. A few years ago, I had health problems. Traditional medicine were unable to diagnose my problem and I got progressively worse. I began to do my own research and suspected gluten and/or other food sensitivies. Reading the book and following their elimination diet and recipes was life changing. These recipes are great tasting and it still amazing how Ally was able to adapt the recipes. It was also a relief to know that there was a community of people facing similiar issues and the supportive environment that this large community fosters..
I’ve really been looking for more GOOD gluten free recipes. Sometimes it’s hard to find ones that are easy to make and taste look. I’m looking forward to seeing the recipes in this book! I am intrigued with fresh inspiration! Liked on fb :). Thanks for sharing! I like this Nourishing Meals 300 recipes book, what attracts me is that it is for the whole family and it is soy-free. I am raw foodist but want to feed my family the whole food the healthy gluten-free, Dairy-Free and soy-free recipes. I have some Vegan Recipe books that are gluten-free and dairy-free recipes, it includes soy that I prefer not to have included.I am exciting about this one that is non-soy recipes book. Thank you! Every since I was diagnosed with a dairy allergy 10 years ago, it has been a challenge to find recipes for items made without dairy products and without a lot of tofu. I am always looking for new recipes to try and love discovering foods and whole grains that i was not aware of. Can’t wait to see the book. My kids and I have dairy, egg, and corn allergies. We love getting good new recipes. Thanks for giving away this cookbook, I’d love to check it out! This book would be perfect for my family. My sister was recently diagnosed with celiac and my husband was diagnosed with MS last year. Gluten free, soy free (even dairy free) cooking has become a new approach in our kitchen. This recipe book would be an incredible help keeping them and our whole family healthy. We have a 7 month old baby and we are slowly discovering that she is allergic to quite a lot. Luckily I’m feeding her my self but she does need the solids. I like her to eat whatever we are eating and we love to eat healthy meals. This book would help me come up with interesting meals that we can all eat together. What intrigues me about this book are the yummy soy free recipes (along with them being free of dairy and gluten!). This comes at an interesting time for us. We are waiting for one of my sons to be checked for celiac disease. The more I read about gluten and dairy, the more I want to get away from it. Soy is also dangerous for us because my other son is deathly allergic to peanuts and has cross-reactions to soy. The cookbook sounds like it would help us be GFDFSF in a healthy way and help us with so many of the issues we are having. Now following you on facebook as well!! As a newly diagnosed coeliac at 60 years am still struggling to get my head round the lifestyle changes the gluten free diet imposes. So always looking for new, tasty and simple ways to feed myself. That pumpkin pie with pecan crust sounds great for Thanksgiving. Pinned it on Pinterest. I’m following you on Facebook. I am interested in this cookbook because I am relatively new to being gluten free, but I have a daughter that I am trying to raise gluten free as well. I really want delicious and safe food for the both of us. We are going gluten free ( possibly dairy free), would love recipes to help us along. I have liked your Facebook page. I <3 you on facebook! I loved the first book so i’m very intrigued by it. I liked how it has a focus on the whole family including children. Learning to cook gluten free for my husband. I am relatively new to cooking gluten free and would love to learn more about it. also, we have discovered that my husband is reacting to eating dairy-so I am starting to eliminate that. I follow Cook It Allergy Free on FB. I like that this book says nourishing in the title, that makes me feel good about eating recipes from it. I also like the fact that its soy free, as I need to avoid soy. Thank you for this giveaway! I already follow Cook it allergy free on Facebook. What Intrigues me is how to replace dairy ingredients without resorting to using soy products…especially in sweet receipes…eg. ice cream, cheesecake, cream desserts. Also many vegetarian dishes use a lot of cheese or cream, so finding out how to deal with these things would be good. I am trying to cut dairy out of MY diet and I often struggle to find recipes that my whole family will still like. I think that this cookbook will such a great help with that! Reading and using Ali’s and Tom’s first cookbook so intrigued me about this one that I put in a request to my local library to order it. They ordered four copies and, because I was their first patron to request it, was able to borrow the first copy they received! It’s on my coffee table, now, but due back on Oct. 16th. Many other patrons are waiting to borrow it, so I won’t be able to renew the loan. This book is phenomenal and I want to own it but, sadly, can’t afford it. For this reason, and many others, I need to win this book. 2. Each recipe must include its VERIFIABLE nutritional breakdown (e.g., an annotated Nutrition Facts label). So, does Nourishing Meals by Alissa Segersten and Tom Malterre, MS, CN meet those two criteria? Because, if it does, I am definitely adding it to my current–and well-used for a change–cookbook collection! I love your book because I have found I feel more healthy, more energetic, less lethargic when I follow a dairy and gluten free diet! So I have been following you on your website for a long time now. I would love to get my hands on your new cookbook so I could explore more creative options and recipes to be healthy! Thanks for all your hard work. I also am following you on Facebook with the page “Cook it Allergy Free”. I also posted about your new cookbook on Facebook. Im interested because of health issues I really want to cut dairy and gluten out of my diet. This book would help me be able to do it for my entire family without feeling so overwhelmed. I love cookbooks! 🙂 Especially ones with pretty cover pictures! Please enter me in the contest. Also, I am following Cook It Free Allergy on FB and will also share this link with my followers. This book intrigues because I am learning to cook for my son who was put on a dairy and gluten free diet. First of all I want to thank you for taking the time to share your knowledge and experience with those of us who are learning to “live without”. I am thankful that I live in a time that I can easily find quick internet support for me and my family dealing with a LONG list of food allergies. I give lots of credit to those before us who did all the experimenting! I want to share my reason why I want to win this cookbook! I do have the first book recommended to me by my son’s Naturopath and I love how the book layout is in larger print with a lot of space and easy reading. The recipes are great and educational and I have full trust in the authors that this second book is great as well. I would love to have a personal consult with them but their cookbook is the next best thing! How I wished I had this book before I had children and would have changed how I introduced foods to them differently. Now I have three sons requiring epi-pens and how ALL the cooking and teaching and learning falls on my shoulders as their mother. I’m planning to make the water kefir recipe from you site and will let you know how it turns out. Keep up the great blog! I don’t think it’s an intrigue – I think it’s more of a quest for Health and Knowledge! I was recently Diagnosed as celiac…. Diagnosed with Hashi’s in 2009 and now I have decided I won’t let those disease dictate how I feel… so I will feed my body what it needs not what it craves! I have a DD and I would LOVE to get her eating healthy now so that when she gets to be my age she already has the tools to eat for her body also! I don’t have a library of GF books…. but I have a great many links… and would LOVE to have some actual books. I have been reading Tom and Ali’s site for a few months and LOVE LOVELOVE IT! I’m intrigued because it seems like finding GFDF recipes that I can feed the whole family is so tough. This one looks like it would be a great resource! This cookbook intrigues me because I love and use their first cookbook and I’ve used a lot of recipes from their blog. I love every recipe I have made from their website. I would love to have their book at my finger tips!! ‘Liked’ you on FB, check! Tweeted about this great opportunity! I really like the “whole foods” cooking aspect!! We have had to cut out grains. I have been loving their first book, and feel this second one would be complementary. I follow Cook It Allergy Free on Facebook. I shared it on Facebook and tagged you in the comments of that post. I have to eat free of all of these items and it is hard to find these kinds of recipes. Also from the example you listed, I am very intrigued. I already follow you on Facebook. I’d LOVE to try out this cookbook. I’ve been trying to follow a somewhat paleo diet for my 3 year olds digestion issues and we’ve got the dairy thing down…but cutting out all grains is proving to be too difficult. Then I recently went to the dr after battling chronic fatigue and other issues for 5 years to find out I have candida in my stomach and need to go gluten free for good. Sooo, we’ve decided to just do gluten/diary free and I need help on recipes in that area!! This cookbook looks perfect for us! I so need this cookbook. My daughter and I are both hluten sensitive and I am also allergic to diary. My husband is under going testing to determine what foods are setting him off. Any help I can get I will share. We have to become a family so we don’t feel alone in this journey. i ‘like’ cook it allergy free on facebook!! I am in desperate need of new recipes. Can’t wait to pick up a copy! I already follow cook it allergy free on fb. I can’t wait to read about meals that focus as much on nutritious ingredients as they do flavor. I have been Gluten free for two years now. It took most of that time to convince my family to get some allergy testing done. Surprise, surprise! We are all now Gluten Free, Sugar Free and Dairy Free! This has been a difficult transition for my two daughters so having a great cookbook that we as a family could use and enjoy would be fabulous!! If I don’t win I will be ordering it! Thanks so much for your site I use it often and follow you on Facebook!! I am so intrigued by this book…it actually sounds like recipes that I could actually make and eat. Recently diagnosed with celiacs..a good cook book is hard to find! I will follow you on facebook!! My son has been gluten free/casein free for 2 years now and I just went dairy free. I have been thinking of going gluten free as well so this cookbook would be great! I am in need of new healthy recipes for the whole family! I follow you on Facebook too! I can’t wait to find a new yummy recipe in this book! I already follow you….love the posts! I already shared this before I even read about the giveaway! I am always excited to find new recipes that fit my GFCF lifestyle. I would love to win this book. I have the original cookbook: Whole Life Nutrition Cookbook and I LOVE it. I have gotten more use out of that cookbook than any other one on my shelf. I share many of the recipes with my clients as well (I am a health coach). I would get so much use out of this lovely new book! Most of my clients have food allergies (and so do I), so they are in desperate need of lots of yummy new recipes. I just liked your page and I already have your app, yay! I forgot to do separate entries. I liked your FB page and already have your app! 1. This book is INTRIGUING because I converted to being dairy free about 4 months ago when I started prepping for my first bikini competition and I plan on staying dairy free after my show! Problem is- I’m at a loss for recipes! This would help me learn the routes of the dairy free world but still with great flavors! I liked you on FB. Shared the post on FB. Liked Cook it allergy free on Facebook, and shared on Pinterest!!! I signed up to follow you on facebook. Your page has great recipes & info on it. Glad I found you. I shared your great cookbook Nourishing Meals on Facebook. 1. I am looking for some easy recipes that I am use in everyday life that will help me obtain good health. I find this very difficult to do however all the information I can get make this easier. This book intrigues me because I am a mother of a 13 month old who has just been diagnosed with the following allergies: Dairy, Soy, and nuts (ie: no coconut or almond milk substitutes) She is not gaining weight properly because there are only a few healthy fats to incorporate into her diet and I am exhausted on menu and meal planning. This cookbook is awesome! I just recently found out that i am allergic to gluten, dairy, and soy and it has so many good recipes for me! Is this cookbook sold in any stores? My 4 yr old son was just diagnosed with Asperger’s and is intolerant of dairy soy and gluten. Im would love to have a copy of this book so I can learn to cook differently for him. I LOVE TO COOK but it has been different since the diagnoses … no more cheesy potaotes or creamy anothing!!! !